We’re proud today to announce that Version 1.11 is now in Public Beta.We hope this version brings a greater amount of flexibility, usefulness and more. Game Pencil Engine is once again closer to it’s goal of professionalism and multi-platform compatibility. We weren’t just sitting back and playing Breath of the Wild since the last update. We were making new things, and making changes to improve your experience and exported gems. The changes made to the editor and engine can be found [here]. There are many changes, additions and corrections that may not be acknowledged in the above change log due to some days I did not log all of the changes I made. One of the biggest change to this version is fixing the find/replace and goto systems in the editor. There are a few more key update within the engine as well; as well as crashes corrected. 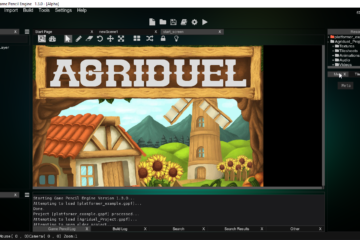 This version helps to make coding and working within the editor as streamlined as possible. If you are creating tutorials, examples, assets and themes we encourage you to upload them to itch.io under the “gamepencil” and/or “gamepencilengine” tags. 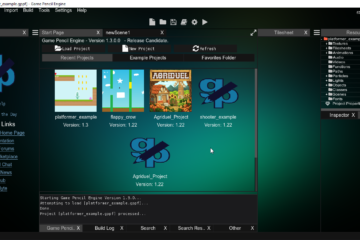 Please note Version 1.1.1 is considered a BETA Build of the Editor and Engine. As such it comes with many warning messages especially in the regard to saving/loading projects and resources. Please backup all GPE projects in the unlikely event you may want to remain in 1.0.3 or earlier versions. In order to remain compatible with 32-bit systems I have chosen to compile the editor as a 32-bit application. In the future I plan to provide both 32-bit and 64-bit editions. Both Personal and Deluxe Edition are available for download now at itch.io. Due to time constraints I have not been able to use VirtualBox to recompile the editor to Linux. In regards to OSX, I plan to soon buy an OSX or borrow a trusted friend’s device. Based on previous attempts for OSX the keyboard shortcuts may need some reworking. More information to come in the coming months. All bugs reports are crucial going forward. Please do not hesitate to report problems via our forums or even our discord chat. We have added a Bug Reporting Repository to GitLab. So please do not hesitate to report any issues here. There is a few more AI related functions I intend to add into Version 1.12; but for now the addition of tile-based functions will do for this current update. Stay tuned Version 1.12 will come with a couple more examples more advanced than the ones packed in 1.11 now. Lastly the goal is to be on all modern video game consoles by the end of this year of course pending approval from the Big 3 console manufacturers. I hope to see your masterpieces in the future.